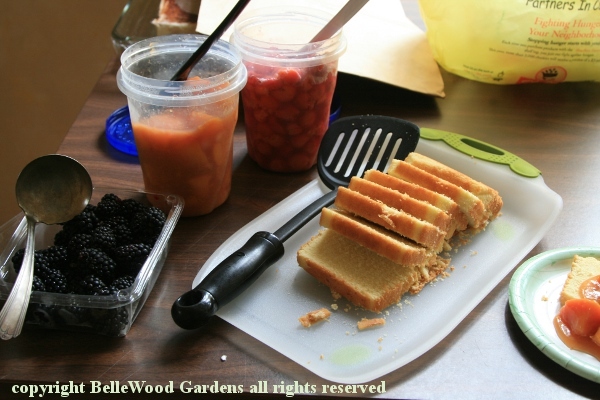 Have you ever noticed how often garden clubs involve food? At the New Jersey Mycological Association's autumn Fungus Fest there's a cooking demo with - what else - mushrooms. It might be a little something before a garden club meeting, to accompany the coffee and tea. The Watnong chapter of the North American Rock Garden Society features two culinary meetings, to be sure, both are held in gardens. There's an evening soirée in spring and a summer picnic. Members supply appetizers and desserts, the chapter provides the entrée. Remarkably, the weather usually cooperates. 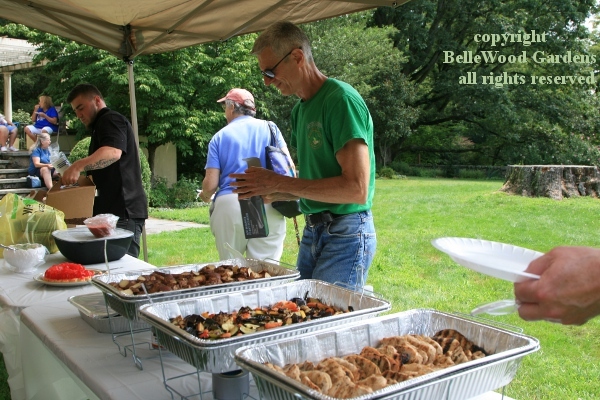 Today's picnic is at the Cross Estate Gardens in Bernardsville, New Jersey. Lunch is served: healthy chicken cutlets (no heavy cream sauce). a delicious medley of roasted vegetables, and new potatoes. Appetizers and entrée are enjoyed as petite dejeuner sur l'herbe. Plates filled, people form convivial small groups in shady places. Desserts are provided in a lovely enclosed sunporch with tiled floor. 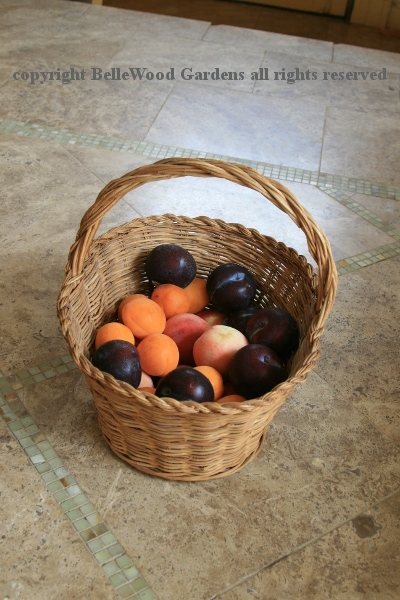 Someone brought a basket of peaches, plums, nectarines, and apricots. The usual brownies and other cakes and cookies. 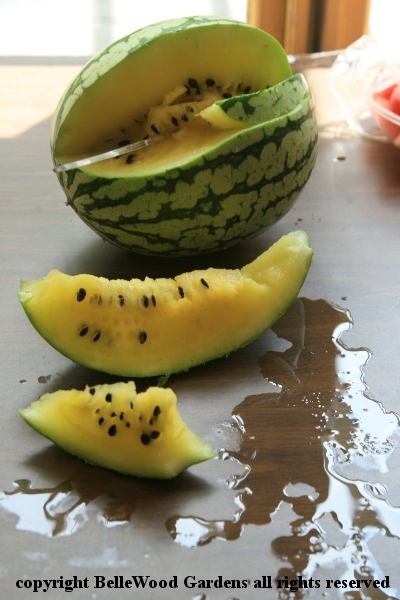 There's a luscious small yellow watermelon. 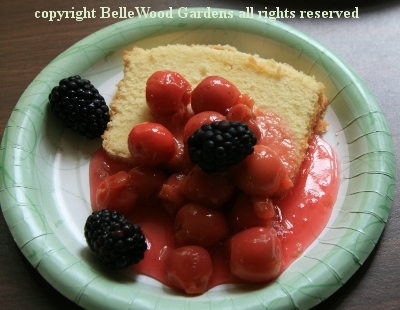 I spent Friday prepping for my offering, a dessert a la BelleWood. 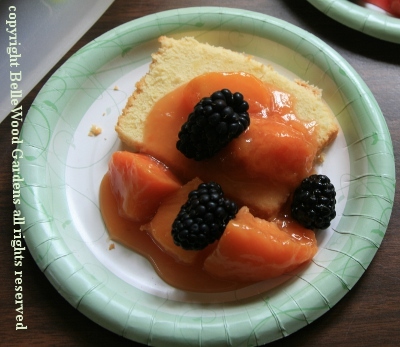 It's a buttercrust pound cake and seasonal fruits, lightly poached. Local peaches with a little sugar, vanilla extract, and brandy. Local sour cherries with some sugar, almond extract, and brandy. And fresh blackberries, for looks and flavor, embellish the fruits. 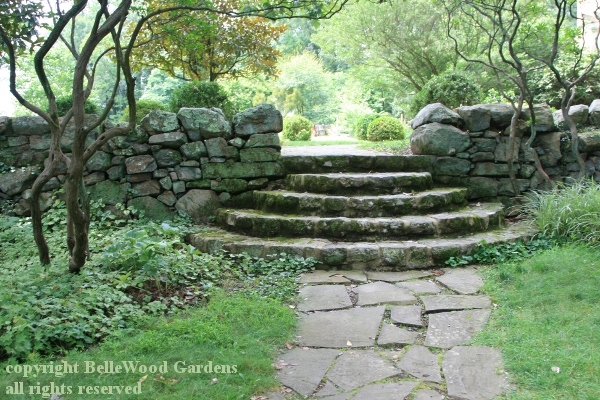 (a bit wobbly in places,) flagstone paths, and these lovely steps. granite. Be patient, I'll tell you that story just a little later. 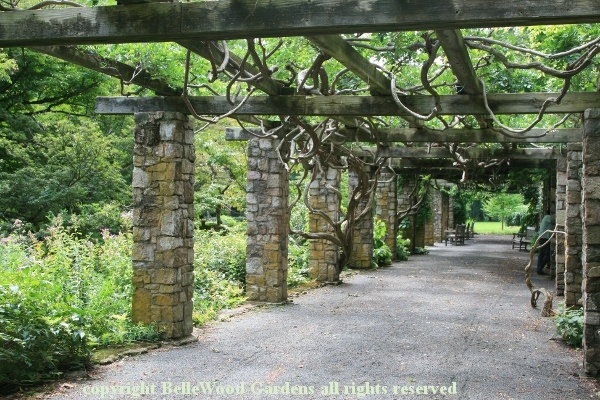 Sturdy and precise stone columns support a wisteria arbor. enjoy their midmorning coffee, tea, and pastry break. Nice! 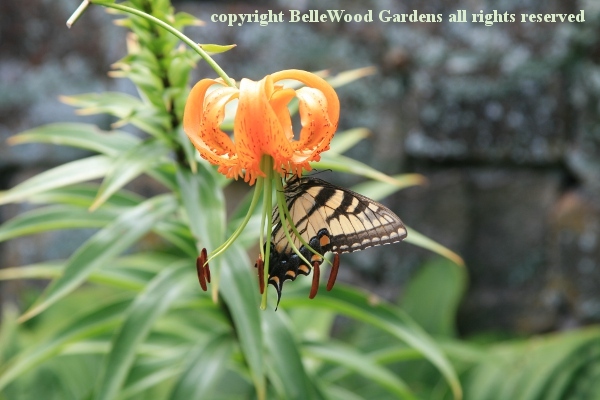 A tiger swallowtail enjoying a nectar break on an orange lily. 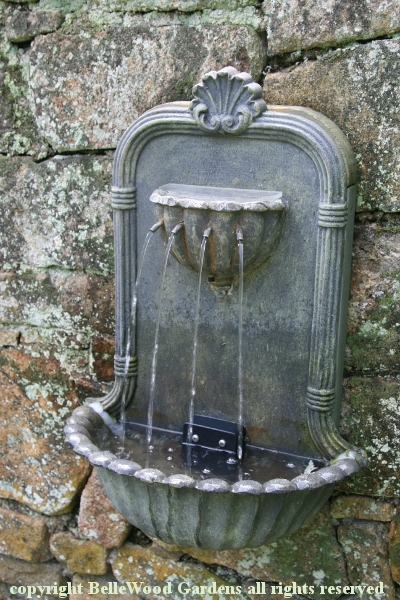 charming fountain in the walled garden. 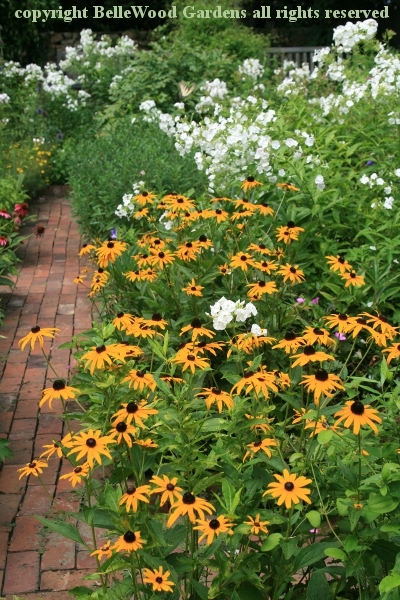 and dark eyed golden daisies of Rudbeckia. 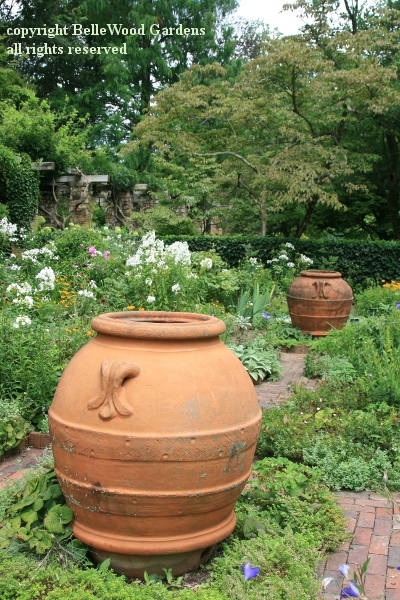 Two large pithoi accent the flower beds and brick paths. 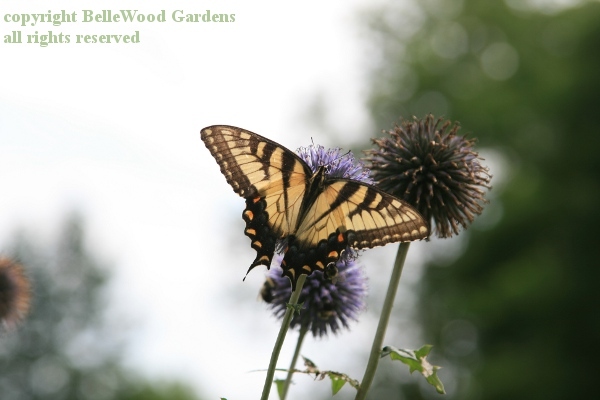 Another tiger swallowtail on Echinops. Once upon a time, early in the 20th century, Mr. and Mrs. John Anderson Bensel assembled some 300 acres for their summer home. 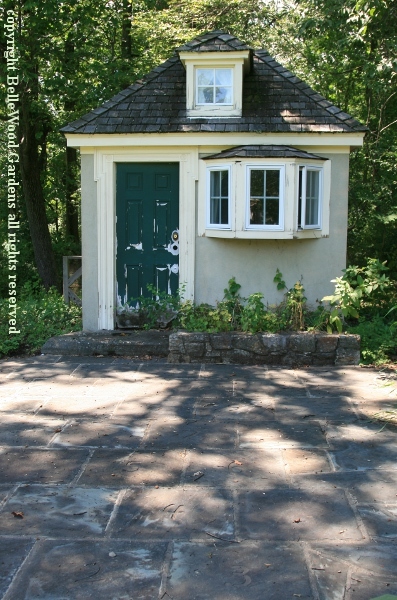 Calling their country property "Queen Anne Farm," they built a 23-room stone house. Mr. Bensel was an 1884 graduate of Stevens Institute of Technology, as a civil engineer. His various jobs included at the New York Aqueduct Commission, the Pennsylvania Railroad and the Philadelphia Water Department. In 1898 he was appointed the Chief Engineer for the New York City Dock Department. No surprise that water, its source and its pressure, was a consideration at his family's summer villa. capped with a wooden windmill. 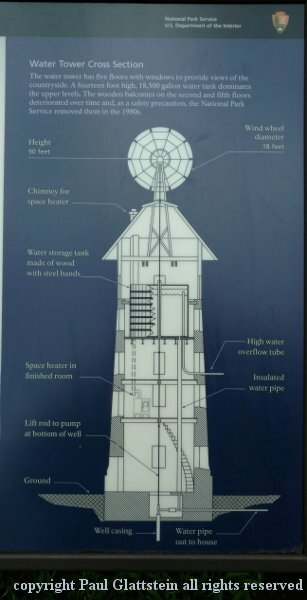 An engine in a separate pump house fed well water into the tower, providing suitable pressure to the house. Several years after Mr. Bensel's death in 1922 the wooden windmill was broken in a storm, sometime in the mid-1920s. 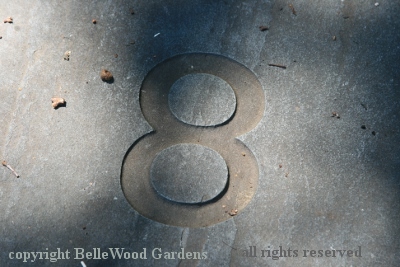 Once widowed, Mrs. Bensel rarely visited the property. 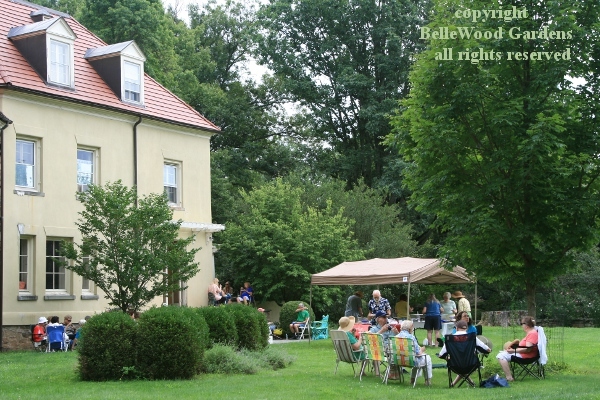 W. Redmond and Julia Appleton Newbold Cross bought the property in 1929, renaming it "Hardscrabble House." 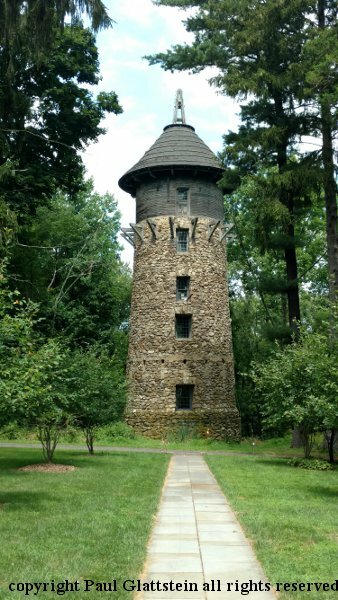 At some point after their purchase the water tower was electrified and today continues to provide water to the house and grounds. an echo of childish voices, and laughter? Instead it is today's summer visitors, and their picnic.